The task force investigating November’s notorious pepper-spraying incident at UC Davis, headed by emeritus UCD law professor and former regent Cruz Reynoso, released a scathing report that blamed ineffective leadership, unauthorized police conduct, faulty decisions, and more. A police spokesperson defended the police response, saying officers had every reason to be nervous while they were surrounded by chanting protesters. The widely viewed video, however, shows a situation hardly fitting that dire scenario. The UC Davis administration said it would "study and assess" the report. 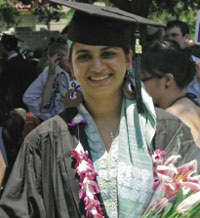 The UCLA arraignment for the 2008 lab fire that claimed Sheri Sangji’s life was delayed again, until June 7, which the judge set as a deadline for settling a plea agreement. An April 15 article in the Chronicle of Higher Education quotes lab safety experts, who see this case “as a pivotal development after decades of exasperating efforts to get universities to take lab safety seriously.” It’s not too late to sign a petition to the LA County District Attorney to hold UCLA accountable. Faculty members at all 23 Cal State university campuses begin voting today on whether to strike if they cannot reach agreement on a contract with CSU management. Mediation has already proven unsuccessful. The contract dispute will go to a fact-finder next, after which the union would be able to strike. Twenty thousand graduate students at the Cal State University system opened their financial aid notices and discovered that CSU grants that take care of tuition for low-income students were missing, according to the San Francisco Chronicle. Instead, students found offers of federal loans at 6.8% interest. CSU Chancellor Charles Reed instructed campuses not to allocate $90 million this year, pending a decision by the system. CSU faces a possible cut of $200 million next year, on top of $750 million already cut this year. A UC education was supposed to be free, remember? That was a central idea behind California’s 1965 Master Plan for Higher Education: Investing in education was investing in the future. Los Angeles Times columnist Michael Hiltzik calls for a return to that commitment. Pres. Mark Yudof has spoken out in support of Gov. Brown’s tax initiative. Riverside County will be investing $10 million in UC Riverside medical school. Following a federal investigation of incidents targeting African American students, UC San Diego has agreed to overhaul its practices for handling complaints of harassment. The campus has created an office to handle such complaints.